I’m no fan of populism, but identity politics is what I most abhor. Unfortunately, identity politics has become the driving force in American politics. And I assert that identity politics has been the main culprit in steering wealthy, highly educated voters away from the Republican party. anti-Hispanic/anti-Eastern European immigrant/homophobic, etc., but Democrats are fighting for -insert ethnicity/gender/sexual identity/religious group here,” Republicans have long had to make their case on specific issues and values. Reagan’s coalition was brought together by a common belief in specific American values. But it was still a coalition built on ideas, rather than on identity or party loyalty. Reagan’s coalition — even as represented by registered Republican voters — voted for those ideas/values, rather than for the “R” next to Reagan’s, George H.W. Bush’s, or George W. Bush’s name (although, G.W. Bush’s election and reelection notwithstanding, I’m convinced that the Reagan coalition had largely disbanded by 2000, and had most certainly broken off into different constituencies by 2004). And while the Reagan coalition has eroded, Republican voters still don’t generally vote on the basis of brand or party loyalty. They still need to be convinced to vote Republican. But, as has been the case for generations, Democrats still do vote on the basis of party loyalty. And while the Democratic base has lost many of its old blue collar, Catholic, Southern, and white ethnic constituents, it has added new constituencies of loyal Democrats. Unfortunately for Republicans, the types of voters who were once attracted to the Republican party — high earners, the highly educated, the upper middle class, wealthy urban and suburban voters — are increasingly identifying with the Democratic party (and becoming unfailingly loyal Democrats). But I’m not sure that Republican populism is the reason for the exodus of the wealthy, educated voter from the Republican party. I think it has more to do with changing currents in American culture. If you spend much time in gentrified neighborhoods, or read “Stuff White People Like,” you know exactly what I’m talking about. Liberal cultural values rule the roost in polite society. And upscale Americans aspire to be more sophisticated (if not more European) than the rubes out in the suburbs, xurbs and rural areas who drive big SUV’s and watch Fox News. Ironically, as the Americans have become more affluent, they’ve been able to afford to be more liberal. Thus, wealthier, more highly educated Americans in urban and decidedly upscale suburban areas trend liberal on cultural/social issues. And increasingly, those voters are assigning more weight to their cultural values than to fiscal issues. Thus, largely due to their cultural leanings, wealthy and highly educated voters are becoming a new constituency within the Democratic identity politics juggernaut, while guys like Joe the Plumber and Tito the Builder represent a new core of Republican base: hard working members of the middle class who either own a small business, or hope to own a small business, and who aspire to move into the upper middle class. The highly educated, wealthy voters of the upper middle class have the luxury of being able to assign great weight to matters that less affluent voters would likely deem frivolous: matters such as Barack Obama’s allegedly towering intellect, Barack Obama’s ability to inspire crowds — sometimes 100,000 strong — with his lofty rhetoric, Barack Obama’s Ivy League pedigree, or the historic, “healing” nature of Barack Obama’s candidacy (as in “Look at how non-racist I am — I support Barack”). But middle class voters who aspire to greater things are still prone to be motivated by the promise of lower taxes and smaller government. It’s yet another ironic twist: highly educated, affluent voters increasingly eschew the Republican party and become a cog in the wheel of the Democrats’ identity politics machine because their education level and affluence allows them to identify with culturally elite, progressive Democrats. And in turn, middle class voters in middle America increasingly identify with the Republican party as the Republicans remain friendly to small business, but ratchet up the rhetoric against Democratic “elites.” Republicans are losing a traditional core constituency (and one that used to be unmoved by identity politics) to the party that created American identity politics, because that constituency — increasingly motivated by identity politics — is attracted to the Democrats’ cultural elite cachet. That’s why, in her short time on the national stage, Sarah Palin has become such a lightning rod in American politics. To middle class, Americana voters, Sarah Palin — as a non-intellectual, non-privileged, middle class American who rose to Alaska’s Governor’s mansion on her own merit– represents all that is right about America: indeed, to these voters she represents the American dream. But to more affluent, more highly-educated voters, her hinterlands accent, her unturned up “ing’s” at the ends of words, the blue collar “first dude,” the family life that at least somewhat resembles the fictional Connors from the 90’s sitcom “Roseanne”, the moose huntin’, and the unmistakable middle America vibe that Sarah Palin gives off are sufficient grounds to oppose her and ridicule her (if not outright hate her). I doubt that John McCain had identity politics in mind when he asked Sarah Palin to be his running mate (sure, it didn’t hurt that she helped to energize the evangelicals and cultural conservatives, but more than anything, I think McCain saw her as something of a kindred spirit — a feisty reformer who had been a thorn in the side of the Alaskan Republican establishment). But thanks largely to a hostile national media (and no doubt, at least in part to the McCain campaign’s total mishandling of her media appearances) she has been turned into the poster child of American identity politics: sophisticates have both contempt and hatred for her; middle American cultural conservative types love her. The Republicans would probably be well served by trying to build a new coalition with fiscal conservatism at the forefront of their platform. It worked well for them in the 1980’s, and again in the mid 1990’s, with the Contract With America. But I’m not convinced that affluent, well-educated, urban voters would be as open to the Republican party as they were in the 80’s and (to a lesser degree) 90’s. I think that there’s been a quiet cultural shift in America, and that it could spell doom for the Republican party, regardless of the party’s platform. I agree with your assertion that one of the saddest things about this election has been the ability of the Obama campaign (or, perhaps more accurately, the ability of David Axelrod) to portray a first term Senator (who has spent two of those four years away from the Senate, campaigning for President), and former South Side Machine/Springfield politician as an agent of change/reform, while successfully defining John McCain — who truly has been a reformer and different kind of politician — as nothing but “four more years of Bush.” McCain has been his own man throughout his time in Washington, and he’s given George Bush and his administration countless headaches over the the last seven years. Remember, McCain didn’t just call for the surge in Iraq, he fought the Bush administration (and Donald Rumsfeld) tooth and nail until they adopted his suggestions, even though doing so was politically unpopular at the time). And he was proven right. 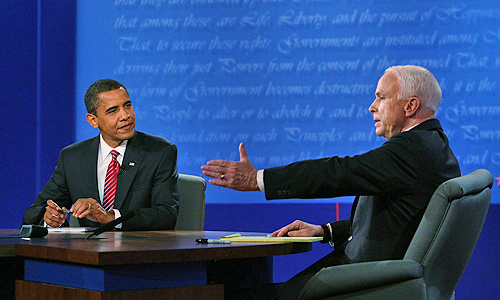 Ultimately, John McCain’s campaign has to be held responsible — at least to some degree — for letting Obama define McCain. But I suspect John McCain expected the public to be more familiar with his record, and more familiar with his personal story/history as an iconoclastic political maverick, than it turned out to be. David Axelrod has stated that he carefully crafted the narrative of Barack Obama’s life in order to give Obama the aura of authenticity. So, essentially, Axelrod created an illusion to make Obama seem authentic. But McCain is the truly authentic candidate, and the candidate with the true street cred. Too bad he wasn’t able to convey that. A horrible loss will NOT be good for the Republican party. It will only deliver a filibuster-proof super majority to the most left leaning Democratic President (and House Speaker) in American history. Divided government is good. Having Uber progressives in control of all branches of government will not be. This isn’t Bill Clinton’s Democratic party anymore. The DLC, Blue Dog Dems are a thing of the past. A crushing win by the Dems would likely propel the Republicans into total disarray — and send them into a long (and potentially permanent) political wilderness — rather than cause the party to remake itself as a libertarian leaning tour de force. Barack Obama promises to fundamentally transform America forever. And while I would certainly like to see some improvements, I kind of like America the way it is.